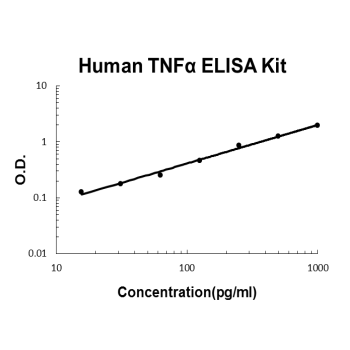 Sandwich High Sensitivity ELISA kit for Quantitative Detection of Human TNF alpha. 96wells/kit, with removable strips. Cell membrane ; Single-pass type II membrane protein . Cytokine that binds to TNFRSF1A/TNFR1 and TNFRSF1B/TNFBR. It is mainly secreted by macrophages and can induce cell death of certain tumor cell lines. It is potent pyrogen causing fever by direct action or by stimulation of interleukin-1 secretion and is implicated in the induction of cachexia, Under certain conditions it can stimulate cell proliferation and induce cell differentiation. Impairs regulatory T-cells (Treg) function in individuals with rheumatoid arthritis via FOXP3 dephosphorylation. Upregulates the expression of protein phosphatase 1 (PP1), which dephosphorylates the key 'Ser-418' residue of FOXP3, thereby inactivating FOXP3 and rendering Treg cells functionally defective (PubMed:23396208). Key mediator of cell death in the anticancer action of BCG-stimulated neutrophils in combination with DIABLO/SMAC mimetic in the RT4v6 bladder cancer cell line (PubMed:22517918). . Protective Effect of Resveratrol against IL-1?-Induced Inflammatory Response on Human Osteoarthritic Chondrocytes Partly via the TLR4/MyD88/NF-?B Signaling Pathway: An ?in VitroStudy? Sun H, Zhu X, Cai W, Qiu L. Sun H1, Zhu X2, Cai W3, Qiu L4. Hypaphorine Attenuates Lipopolysaccharide-Induced Endothelial Inflammation via Regulation of TLR4 and PPAR-γ Dependent on PI3K/Akt/mTOR Signal Pathway. Huang Q, Xue J, Zou R, Cai L, Chen J, Sun L, Dai Z, Yang F, Xu Y. Exp Ther Med. 2014 Nov;8(5):1648-1654. Epub 2014 Sep 11. Nr4A1 Is Associated With Chronic Low-Grade Inflammation In Patients With Type 2 Diabetes. Q: Does EK0525, EK0392, EK0373 react with BSA? A: EK0525, EK0392, EK0373 does not react with BSA. Q: For EK0525, EK0392, EK0373, do these kits have binding for the forms of cytokine other than just the active form? A: EK0525, EK0392, EK0373 are able to detect total forms of TNF-Alpha, IL-1Beta, and IFN-Gamma. Q: Does EK0525 work with whole cell lysates? A: EK0525 is not suitable for working with whole cell lysates. A: Yes, 4-parameter logistic function can be used to calculate sample data.